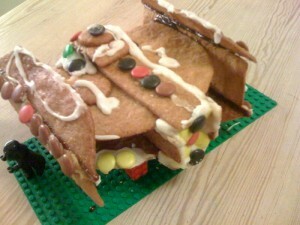 Following up yesteryear’s gingerbread Millennium Falcon was a bit hard. 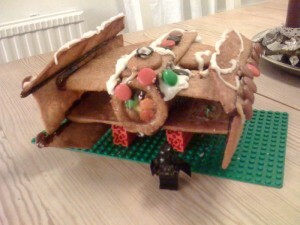 The oldest of the kids, a couple of his friends and I, finally built Darth Vader’s Tie Fighter in gingerbread. Note the transparent window in the front, made from melted jellyman. While I was looking the other way, the rascals filled the hull with nonstops and sealed the back with icing. Happy Advent everybody! The observant SW fan may discover that one of the bent solar panels is missing. It actually fell into the sugar pan, and was melted. 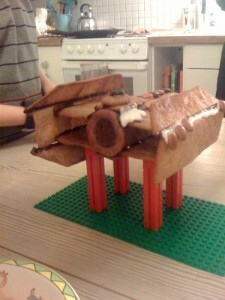 We pretend it was shot off by Han Solo while baking a new one. You are currently browsing the On the third side blog archives for December, 2010.